The Komsomolskaya station is one of the biggest attractions in Moscow. Designed by Alexey Shchusev, frescoed ceilings, chandeliers and artwork gives the look of a museum. 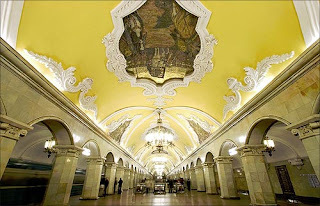 The station is noted for its being located under the busiest Moscow transport hub, Komsomolskaya Square.